Who says penguins are cute? The title tells readers everything they need to know. 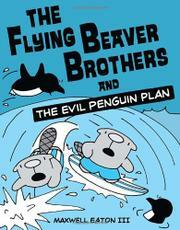 Or, as Ace puts it, “Hundreds of evil penguins!” Ace is a beaver who likes to surf. His brother Bub likes to nap. Together, they have the skills to save their island from a plan involving a gigantic refrigerator. (Eaton has clearly taken great delight in drawing a fridge the size of Graceland.) Children will know if this is their kind of humor when they hear that the story is about an evil refrigerator that threatens the planet. The pictures look, charmingly, like doodles readers might have sketched during a boring class. Some of the jokes are dumb. (BEAVER: “Something smells fishy….” SEABIRDS: “That’s probably us.”) Some are transcendentally dumb. A pun about blueprints is set up with the precision of a rocket launch or a Rube Goldberg device. Not every punch line works, but halfway through, everything clicks into place, and the plot achieves the sort of energy that would have made Goldberg proud. The second book in the series, The Fishy Business (releasing simultaneously), is funny from the first panel. The laws of probability suggest that volume three will be a real achievement. JOHNNY MUTTON, HE’S SO HIM!